Veja as praias na costa norte de Oahu, incluindo Waimea Bay, famosa pelo surf de ondas grandes desde a década de 1960. Este passeio é uma de suas melhores apostas para visitar todas as principais atrações a um preço atraente. Tenha uma noção da incrível diversidade de pontos turísticos de Oahu durante o passeio de 8,5 horas em ônibus, explorando uma variedade de atrações naturais e culturais da ilha. Se você está procurando uma oportunidade para ter uma visão geral de tudo o que a ilha havaiana tem a oferecer, ou se deseja cobrir muito terreno em um curto período de tempo, essa excursão é uma ótima opção. Comece a sua viagem com coleta em seu hotel em Waikiki pela manhã, continuando pelo bairro de luxo de Kahala enquanto se dirige para Diamond Head. Esta cratera de 350 acres (142 hectares) foi deixada para trás por um vulcão agora extinto há muitos milhões de anos. Pare no Amelia Earhart Lookout para ter uma ótima vista dos surfistas na praia abaixo. O lookout é nomeado para o aviador feminino icônico que completou o primeiro vôo solo bem-sucedido de Honolulu para a Califórnia em 1935. Continue pela estrada até a Baía de Hanauma, uma reserva natural marinha conhecida por seu ótimo mergulho com snorkel e águas cristalinas. De lá, você segue para o Halona Blowhole, uma formação rochosa na costa que força o oceano a se dilatar através de uma abertura estreita, criando explosões de água impressionantes. Dirija ao lado das colinas de Oahu em direção a Nu'uanu Pali, um mirante que oferece vistas panorâmicas das praias de Kanehoe e Kailua. Sua próxima parada é no Templo Byodo-In, uma recriação do Templo Budista de 950 anos, encontrado em Uji, no Japão. Passeie pelos intricados edifícios do complexo do complexo e pela brilhante estátua de Buda de ouro de nove pés (metro de árvore), tudo situado entre os belos montes das Montanhas Ko'olau. Prossiga ao lado do North Shore de Oahu, admirando a vista panorâmica da Ilha de Mokoli'l (Chapéu do China) e da Baía de Kahana enquanto você dirige. Você chegará em breve a algumas das melhores praias do North Shore, incluindo Sunset Beach e Waimea Bay, conhecidas mundialmente desde os anos 1960 como o epicentro da cultura do surfe de ondas grandes. A praia será repleta de ciclistas de ondas grandes durante os meses de inverno, quando ondas fortes atingirem esse trecho da costa. Afaste-se da costa de volta ao interior de Oahu, indo para a plantação de Dole que fica no centro. Faça uma breve parada para conferir os jardins verdejantes da plantação e percorra sua loja de presentes. Durante a viagem de um dia inteiro, você terá uma hora para fazer uma pausa em um restaurante para almoçar (às suas próprias custas) e terminar o dia com um retorno ao seu hotel. The tour was v disappointing, the list of pts that were to be covered was deceiving, a lot of those pts were merely drive through. Important pts like Manoa falls was not covered, instead unnecessary marketing stops were made to a general store for 45 mins, lunch was 11/2hr but then dole farm was tooo short,time allocation was faulty. Most frustrating part was that despite 24 hr cancellation policy, when we called to cancel a sick family member’s ticket we got quite the runaround. The tour guide was good. Don’t get me wrong, our guide was great. Tommy was very informative and talked through the entire tour which did a loop around the island. We skipped the areas I was most excited to see, the nature preserve and the Blowhole and Diamond Head Crater. The driver said there wasn’t any parking as many other tour companies had beat us to these popular attractions. I wondered why we were on a coach bus that could seat 60 people when our group was only a dozen. To make up for the time we would have spent at these wonderful natural attractions, our driver stopped at a random rocky beach that was not appealing and dropped us for half and hour at a delapitated strip center that featured a Jack in the Box, Subway, ice cream shop and overpriced trinket store. This would be the reoccurring theme of the day, being dropped for 30-45 minutes at various tourist traps including the Dole pineapple compound (worst ice cream and chocolate I’ve had on all the islands of Hawaii), a macadamias nut plantation where I saw our driver take a handful of cash from the owners (they must get paid by the head), and the the ranch at Kualo which featured a hasty 15minute tour of the property. The lunch buffet didn’t have much choice and the majority of the food was heavy and unappealing (bean chili, ribs and cake) but we made due with some chicken and rice. The Kuala Ranch was packed with tourists and had a massive gift shop featuring items that were made in China. This experience was frustrating, it didn’t feel like we experienced any of the nature and natural beauty we had signed up for and we only flew by the beautiful beaches of the north shore and the driver wouldn’t even stop so we could see the sea turtles on Turtle Beach. I guess he was in a hurry to get us back an hour earlier than schedule so he could stick his hand out for a tip. 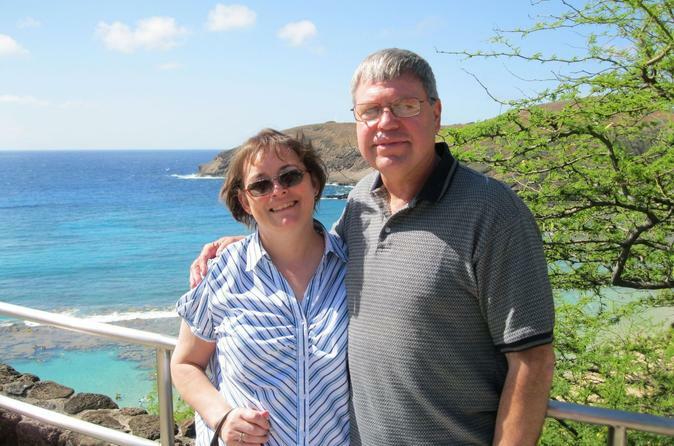 This tour was in a comfortable motor coach van with a company called Polynesian Adventure Tours. Guide was a very positive and energetic Samoan guy by the name of Kalaa (pronounced like “Clay” with an “ah” in the middle between the “C” and “L” to make it two syllables).The tour picks up people from multiple hotels between 8:15- 9 AM and then sets off on its way. Lasts until about 6 PM with a lunch break around 12:30-1 PM at a picturesque place called Kuuola Ranch. Guide is also the driver and tells many interesting fun facts about each place we visit, as well as about Hawaii in general. Some of the places we saw included Hanauma Bay Reserve, the Byodo-In Japanese temple, Waimea Bay, the Halona Blowhole, the Dole Plantation, and at the end, a beautiful scenic view of the Honolulu area from a viewing area called Nu’uanu Pali. The tour is long and should not be taken by those with low energy and stamina. 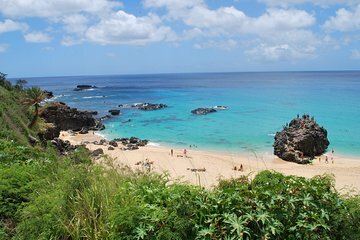 But if you can complete it, it will definitely be one of the most fun and fulfilling tours offered by any tour company that you can take of Oahu. Would definitely take other similar tours with this company and guide again!! Tommy was a great entertaining driver and took us to great spots. The commentary was great and we saw a lot in the time we had. Truly lovely experience!